At the first move in this problem White must choose between two plays of the same size (miai). One dominates, and, in fact, textbook commentary in a similar position says that you can even consider it to be worth more, despite the miai. Let's see what light difference games can shed on that question. Here we have set up a difference game to compare the White plays and ( in the mirror position). Does this position favor either player? If White plays first she gets tedomari and wins by 1 point. This difference game favors White, so White should play in the original diagram, unless ko threat considerations predominate. This is so regardless of other plays on the board, except for kos. 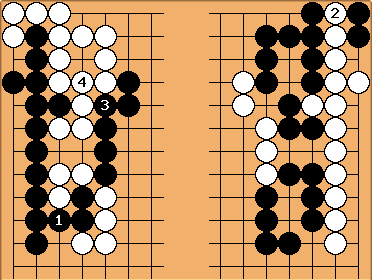 What about original play for Black? Here we have set up a difference game to compare the Black plays and ( in the mirror). Black to play gets tedomari to win by 1 point. If White goes first the result is jigo. This difference game favors Black, so Black should also favor the play on the left in the original position, subject to the caveat about ko threats. 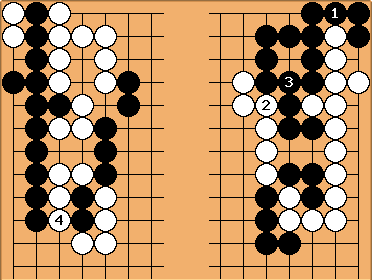 That play dominates the other because of the possibility that White will be able to play the "reverse sente" (not really reverse sente because it is an ambiguous move). This difference is not enough to alter the miai value of the play, but it does make an infinitesimal difference in the chilled game. This was not understood in 1980. Still, the textbook said that it was a better play. 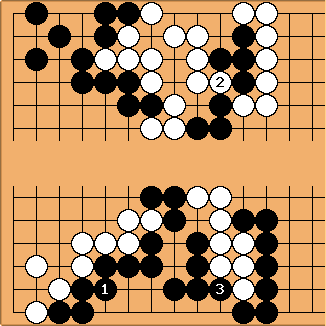 It did not matter in this problem, but let's compare plays in the second miai. Here we set up a difference game to compare White plays and ( in the mirror). 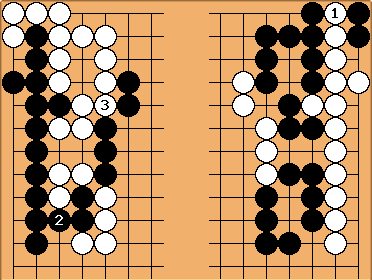 When White goes first the play is like the first difference game. White gets tedomari to win by 1 point. 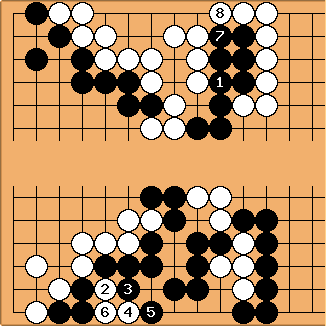 And, as in the first difference game, Black can only get jigo. White to play should take the simple gote and save her two stones. Now let's compare plays for Black. Should Black play or ( in the mirror)? First, White takes her sente with - and then takes the right miai to get tedomari with and win by one point. Here again, White interpolates the sente exchange, - , to get tedomari, for jigo.